At age 14, Alexis Lavarine, left, already holds six national and three world boxing titles. It's a gray December morning at Louis Armstrong New Orleans International Airport and David Lavarine is terrified. 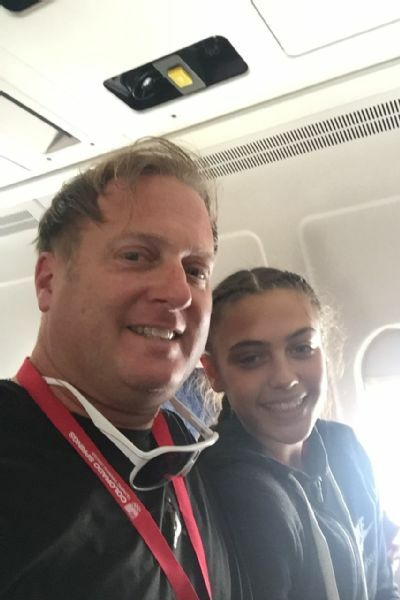 The burly 46-year-old gym teacher sits next to his daughter, Alexis, on a flight bound for Kansas City, where he plans to coach her at the USA Boxing Junior National Championships. But David isn't stressing over Alexis' upcoming bout. Violent rains pelt the fuselage and lightning zigzags across the horizon, harkening ominous flashbacks of the stormy, 1982 Pan Am crash only two blocks from his childhood home, one that claimed the lives of 146 passengers and eight people on the ground in Kenner, Louisiana, including three of his classmates. As the plane accelerates down the damp runway, David closes his eyes and prays. "I had my (late) father's rosary in one hand and a fistful of my daughter's thigh in the other," he says. "If I could choose, I'd much rather drive." The next day, Alexis, 14, scored a unanimous decision over a battered and bloodied Maricia Sustaita in the 138-pound championship. The win, a seminal milestone on a résumé that already boasts six national and three world titles, cemented Alexis' spot as the youngest member of the U.S. Junior Olympic Women's Boxing Team. It also paved the way for a summer tournament schedule that includes additional departures to West Virginia and Fort Lauderdale, and a return visit to Kansas City for the Ringside World Championship at the end of July. David Lavarine, left, admittedly doesn't like to fly. But he knows it's the most efficient way to get his daughter Alexis the best exposure in her boxing career. While her boxing career continues its prodigious ascent into rarefied air, Alexis Lavarine (19-3) has been setting her sights on the 2020 Summer Olympics, and she won't be satisfied until she earns a gold medal. This vision is buoyed by the International Olympic Committee's recent decision to add two more weight divisions (including a 152-pound class that Alexis thinks she could fill). "I want to represent my country -- right now that's my main goal," she says. "Being on the (Junior) team will eventually give me international exposure against some of the people I might see in the Olympics." 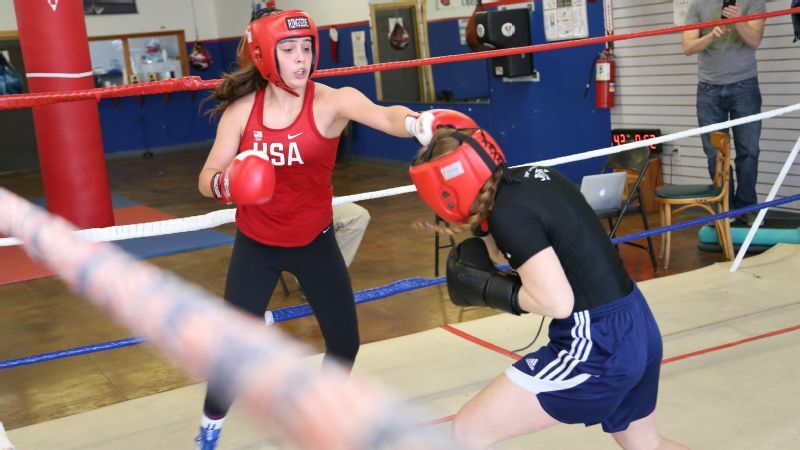 In April, Alexis and 21 other top-ranked amateurs absorbed the wisdom of USA Boxing coach Billy Walsh during a weeklong camp at the Olympic Training Center in Colorado Springs, Colorado. The experience was draining, physically and emotionally, but it put Alexis' life in perspective. The dieting, the aching muscles, the long hours working a heavy bag while her friends were enjoying the trappings of a traditional childhood -- it all had meaning. "Qualifying for juniors is a big stepping stone and it gives you the best chance to make the 2020 team and the best chance to become an American hero," Walsh says. "To make it this far, you have to be different. You have to be exceptional. You have to be a special person." And in Alexis' case, it helps to have a special relationship with a dedicated dad. Alexis was a fighter long before she picked up a pair of boxing gloves. At 4 months old, she battled a severe upper respiratory infection. It wreaked havoc on her immune system, making each breath a sickly struggle. David lied on the floor next to Alexis for months, making sure her body was kept upright in a baby bouncer to restrict phlegm from coagulating in her lungs. "I had to give Alexis treatment every four hours," he says. "For a while, it was pretty serious." So was the bond they forged. Shortly after her condition improved and she took her first steps, Alexis began tagging along with David on his workouts. She mimicked him as he did one- and two-legged hops along the levies of the Mississippi River. By age 3, she'd even try to match him, stride-for-stride, as he ran up and down the bleachers at the local high school. David was a high school basketball star and coached in a youth league after work, so Alexis naturally gravitated toward hoops. She was a quick study and by the first grade was the best player on her team. Alexis' athleticism also helped her excel at track and field, soccer and softball. Sports became an extension of their relationship, and David was her biggest fan. Her foray into boxing, however, was met with skepticism -- at least initially. As David tells it, Alexis saw a match on TV and wanted to give it a try. He told her no, feeling uncomfortable about the idea of seeing his little girl, then only 7, getting smacked in the face. Alexis persisted, however, and eventually got him to take her to a local boxing show a few weeks later. David watched her sit through six hours of carnage without flinching and knew he had his hands full. A few days later, David took Alexis to a neighborhood boxing gym, thinking she'd become discouraged about being the only female in the building. No such luck. She quickly embraced the challenge and looked forward to sparring with boys that were bigger, faster and stronger. "The first time you get someone in the ring when they get hit in the mouth, you know right away whether they want to do the sport or not," David says. "Alexis never stopped coming." The sweet science became an obsession. Whenever she wasn't going to school or finishing homework, Alexis trained. 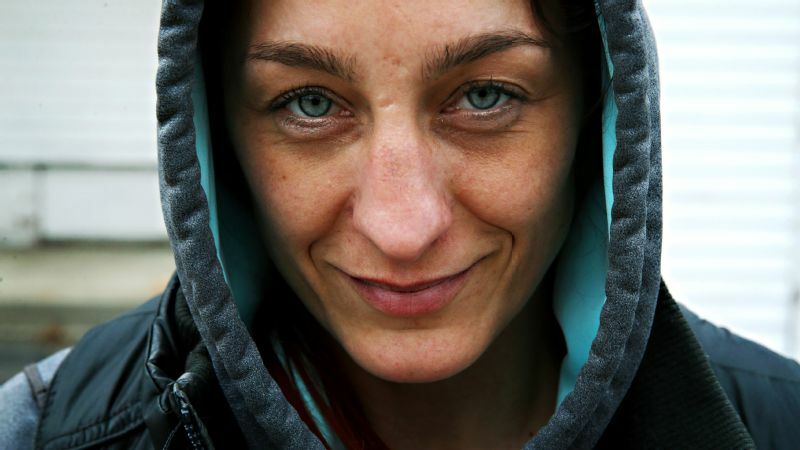 She lifted weights, skipped rope, threw punching combos and ran many miles at the local park up to five days every week. The local Fox TV affiliate eventually noticed the pint-sized pugilist from Kenner and showed up with a camera. "The segment was called 'Ponytail with a Punch,'" Alexis says with a laugh, reflecting on her first taste of the media limelight. "Even then, I was always really determined. I've always hated losing more than I love to win." Since Alexis wanted to be the best, David took over as her trainer and they hit the road, knowing it was the only way to get the best competition. They loaded up the family's Nissan Armada each summer and traveled to distant tournaments across the South. After enduring early growing pains (two tight losses during her first two years), Alexis started to string together some impressive victories. Her first came at age 11 when she defeated Cheyenne Crutchfield, 13, in the final at the Title National Boxing Championship. Alexis was finding success with multiple methods. She could float around the ring like an apparition and slip punches. She could outthink and out-hustle anyone she faced. She always seemed to be a few moves ahead. And by the time she fought Crutchfield, she owned a jab that could make a nose look like a crime scene. "Cheyenne had 32 bouts and Alexis had only four," David says. "Alexis won by unanimous decision and bloodied that older girl to a pulp." 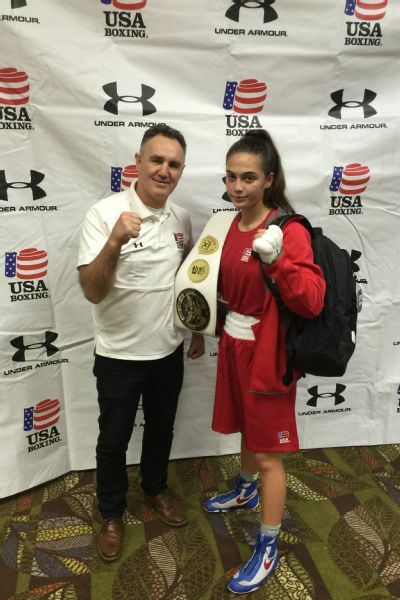 As she grew older, taller and even more talented, Alexis went on to capture the National Junior Olympics and the National Golden Gloves and Ringside Championships. The New Orleans Times-Picayune and Baton Rouge Advocate chronicled her accomplishments, and she made guest appearances on the local ESPN Radio station. "As I've seen in these national and worldwide tournaments, Alexis hasn't even tapped into her full potential yet," Louisiana boxing promoter Les Bonano says. "She has so much natural ability. When she steps through those ropes, she becomes a different person. Alexis is only going to get a lot better than she already is, and she's already fantastic." David deflects credit, even though her progress hinges largely on his commitment to test the limits of her comfort zone. His whatever-it-takes mentality has taken them to sparring sessions at rusty, dilapidated gyms in some of New Orleans' roughest neighborhoods. He's pitted Alexis against boxers whose experience very much exceeds her own. He throws Alexis to the wolves, giving her the exposure needed to readjust to any style or situation. Outside of boxing, it's a different story. David resumes his role as a concerned father and clings to Alexis like shrunken Under Armour. He's always one step behind, making sure she's well protected and making good decisions. This extends to strict surveillance of social media. David allows Alexis to text message friends and recently green-lighted a Twitter account to help generate positive publicity. He's also removed malicious remarks posted to her training videos on YouTube. Two years ago, he even transferred Alexis to a new middle school after reading spiteful commentary about her on another parent's Facebook account. David won't provide specifics, but relates the incident to an experience he and his wife, Carla, shared weekly with Alexis, his other daughter, Aubry, 11, and sons Colt, 8, and Levi, 6: "I'd take them to the seafood market, and they'd always ask me why the crabs are able to stay in an ice chest that's not covered," David says. "The crabs on the bottom always pull down the ones on top. I tell them that that's what happens in life -- the ones on the bottom always try to hold you down. It's human nature. When you're successful, some people want to knock you down." He'd rather see Alexis focus her energy on knocking down rivals in the ring. Her recent inclusion on the Junior Women's Team makes this even more crucial. "She has brains, beauty and athletic ability," he adds. "As long as she keeps using all three and keeping the distractions away, she's headed to stardom." "To make it this far, you have to be different. You have to be exceptional. You have to be a special person," says USA Boxing coach Billy Walsh, who trained Alexis Lavarine at the Olympic Training Center in April. David hates goodbyes. He knows he'll say it in a few years when Alexis moves away to college and, symbolically, if he walks her down the wedding aisle. That's why he'll nervously follow his daughter down the aisle of another airplane later this month, overhead bag in hand, moments before they travel to West Virginia for the 2017 Junior Olympics tournament. There's no way David would consider sending Alexis by herself, and the cross-country voyages in his SUV are exhausting. Hitting the friendly skies has become a logical (and harrowing) solution to keep her fresh. "My relationship with my father has allowed me to get through rough moments because I know he is trying to help me excel," Alexis says. "He's proven he will do anything to see me get better by doing things he isn't comfortable with. He keeps me disciplined so that one day I will be able to take home Olympic gold." That dream could become reality in 2020, just before Alexis would be entering her senior year at Fontainebleau High School in nearby Mandeville, Louisiana. She'd like to represent the U.S., but should she fall short, the 2024 Games become an option. "Alexis has tremendous potential, and she's a fantastic athlete," Walsh says. "She has the desire and passion. Hopefully we'll continue to see her improve." David, no doubt, will work extra hard to ensure Alexis reaches her destination atop the medal podium. In the meantime, he will continue to savor the journey -- even if it necessitates frequent flyer miles. "As I get older, it's going to be harder and harder to lose her," he says, fighting back tears. "As a dad, you make sacrifices and go above and beyond to help your children chase their dreams. It's fulfilling to see a child achieve such grand things at such a young age, and, with Alexis, I don't think we've even scratched the surface yet." Chris Scarnati is a Pittsburgh-area sportswriter.